In our turbulent times, it might be difficult to see in what direction history is taking us. What are the long term trends? What will last? How will the world or mankind look like a (few) generation(s) from now? History gave us some clues. History was not a steady stream of changes, driven by natural events or selfish genes. It was a vast stream with many wild swirls, thundering whirlpools and eddies pushing many events in the wrong direction. But overall progress was made not only physically but also in our psychological, social and spiritual wellbeing. Some caught in a wrong eddy might have a different opinion, but as eddies, negative developments have limited lives. Eventually the push for progress will prevail. “Survival of the fittest” . . . and the fittest ideas. Let’s look at some of the different currents. Our average age has increased dramatically. We are getting taller. Better fed and cared for babies. “Abnormalities” recognized and aborted during pregnancies. Our average health improved. Although many diseases are more common, they are much more manageable . . . HIV no more life threatening. For the unlucky ones, prostheses are improving from rudimentary crutches to sophisticated limbs, from a heavy iron fist to delicate hands that can handle raw eggs. Genetics. We can modifying genes to eliminate hereditary diseases. We will be able to build in immunities and enhance whatever we think needs enhancements, designer babies, DNA printers . . . We are even tinkering with DNA itself. Today it consists of only 4 building blocks, cytosine (C), guanine (G), adenine (A), or thymine (T), limiting the combinations of what “biology” can produce. Theoretically, alternative chemistries are possible with different nucleobases or with different combinations. Also, the deployment can be influenced in different ways. If we want to survive on Mars, a lot of modifications will be necessary to cope with the environment and the radiation. Artificial intelligence. Intelligence is a multitude of cerebral skills, memory, recognition of patterns, different ways of thinking and emotional coloring, creating . . . Many of these skills can be enhanced with external devices getting more powerful and complex by the day. For memory, calculating skills, handling big data . . . we have completely surrendered to computers already. New “gadgets” are introduced continuously; we are no more surprised about driverless cars, automatic translation, speaking robots . . . more just around the corner. The last frontiers such as “consciousness” are being taken on. We can transplant mice heads already . . . yes, human heads are still too big and complex. Eventually, virtual duplicates of ourselves might be beamed into the universe. The foundation of knowledge has moved from beliefs based on the absolute authority of revelations towards observational facts and reasoned truths, where possible based on “double blind experiments”. Truths become just an assumption “for the time being”. Science asks everybody to please prove that its “truth” does not fully explain the facts, or to please come up with a more elegant explanation. Validity is relative, only within defined borders. Some “dogmas”, though, remain tenacious, especially when they are dipped in a sauce of religion or nationalism. Technology. Products evolve into artifacts providing more functions and needing less material. The ideal final results will do almost everything with almost nothing (Altshuller). Watch what your phone can do and how it got smaller (including all cabling and switching panels), your car . . . , even clothing . . .
Science. From interpreting and expanding the revealed to the pure empirical inquiry by observations, experiments, deductions, modeling. Its field expanding to the infinite small, to the infinite large, and the infinite fast. Economy. Hunting & gathering. The agricultural revolution or husbandry as “automatic” hunting and fields as “automatic” gathering. The industrial revolution with extensive “automated” craftsmen and extensive “machined” agriculture. The digital revolution leading to “automatic” production and services. The knowledge revolution coming with “automatic” thinking. The future with a foundation of automated farming, automated manufacturing, automated services with on top many hobby farmers, hobby craftsmen, hobby white collar workers, and artists in a peer to peer economy. Philosophy. Difficult, Buddha, Confucius, Laozi and Plato, Socrates, Zeno, Jesus, Seneca . . . they all lived so long ago. But maybe the concept of “happiness” and the understanding of “utility” are deepening and expanding. The conversion of the Western hardware approach, humans as individual machines and the Eastern software approach, humans as spiritual connected in the “cloud”. A happy and healthy family, creative and fulfilling ways to enjoy, deep friendships, contributions to society emotionally rewarding, athletic, artistic and intellectual skills . . . a mystical awareness with the absence of dukkha, “suffering or unsatisfactoriness”. Need Edgar’s help here. Religion. Belief in a multitude of good and evil spirits in the nature around us and of our ancestors. A multitude of more potent active and passive gods. A One all-powerful humanlike God revealed through prophets and holy people. Ultimately a more abstract God, justified by reason. The domain of religion expanding, too, encompassing the supernatural, spiritualty, live rituals, the root explanation for everything, incitement for moral behavior, consolation in hardships, inspiration for a better life . . .
Society first organized around families and clans. A break through with larger associations of clans requiring patriarchs, evolving in empires and theocracies with owner/slave relationships, then feudal systems with kings, nobles and servants. The next big step with the rise of State Generals representing the 3 estates of the aristocrats, priests, and commons, as foreboding of crude democracy. Eventually, the age of enlightenment first with a narrow participation in the democratic processes, no women, no illiterates, no poor involved, followed by an increasing representation with increasing checks and balances. The democratic horizon evolved from small clans over clan clusters, states, state clusters, eventually giving birth to the UN. Globalization with multinationals and markets with one international scope. The binding force from family ties, over ownership of land, communality in language, culture and religion, around economic unities, up to shared responding to global conglomerates and challenges. Human rights first for the wealthy white man only, then for all man, later also for women, believers in other (and no?) religions, LGTBs, the disabled and less fortunate ones. Animal rights (?) The norm expanded from a few developed nations into the international norm. Civilization is just a very thin veneer, our genes developed over millions of years are still very present. Reason and feelings fighting. Many of our deep beliefs are out of date, we inherit them from our parents. They can be very potent, especially if they get dressed with a religious or nationalistic sauce. Education is bound to fall behind, we learn the values of the previous generations. The fight between tradition and progress. Why are some backlashes happening now? We live in an “unfrozen situation” caused by a fast changing world going through dramatic transitions. A fast shrinking word with globalization, global warming, and smaller and smaller mono-cultures. With an unfinished shift from a manufacturing economy into a service economy, we are preparing already for the next shift into a hobby and knowledge economy. The strict nation state surrounded by physical walls and walls of tariffs. Belief in our purity and that the “others” cause the problems. Trump’s viewpoint as a real estate manager is old fashioned. Real estate was based on land, always limited; it can be divided but not created (except for the Dutch who created half their land themselves). It is basically a zero sum world, an easy concept. Duterte’s viewpoint as a mayor is that a lot is outside his control and will need tricky methods to eliminate the problem. Xi Jinping comes from the Land in Middle, seeing the rest of the world as its outskirts to be used by the main land when opportune. We need a sea as buffer during conflicts to keep off any potential enemies. The options are limited . . . Wait it out, it will all come out good. Close our eyes and pray. Help to speed up the change, any change, by being active in the stream of history. Be active on the political front or on the technology/science/economy/philosophy/religious fronts. Stay active communicating on this blog. All influences everything, it influences the “Zeitgeist”. Progress in one area will influence progress in other areas. ← What is your role in building a strong, upright, unified nation? Thanks for inspiring a positive view of our deeds and thinking, from a perspective that I would imagine vastly superior aliens arriving on earth might have. They see the context, human development that is ever so slow because it is constrained by a gross lack of self-perspective and a stubborn inability to sort out backward from forward. The current populist movement is an example of this blindness and backwardness, and would be seen as a descent into ignorance and self-punishment, a kind of denial of the higher purpose of mankind, if done right. The call to action, to PARTICIPATE, I suspect is what God Himself would expect us to do with the free will that we are granted, a great gift so often wasted by the ridiculous need to prove we are big shots. Weaponry, from a simple stick or stone up to an arsenal of hydrogen bombs, and the codes in the hands of an “Amerika über alles” (America first) guy, a lunatic in North Korea and never-ending settlement builder. Just one accidental push of a bottom and mankind is history. We could talk about our labs able to modify the DNA of bacteria to make them lethal resistant to all antibiotics and it gets easier to do this, the labs smaller and smaller. Only on depressive scientist and mankind is history. Let’s hope that God Himself is not playing with these ideas. Breathtaking. I feel like looking into a cathode ray tube watching a flow of luminous particles in the fleeting micro seconds before it hit the screens. – the ones that contribute – those whose brains that helped push human development forward in the various fields enumerated. – the ones that create eddies — the Hitlers, the Genghis Khans. – the ones that came along for a free ride — that’s the majority of us. The last group will decrease dramatically once we manage to extend our frontal-neocortex with a rapid expanding cloud to achieve a more common consciousness. Today’s external connection via our e.g. smartphones is too cumbersome. The coming Google glasses more easy but still external. Animal trials for internal connections going on. Predictions vary from optimists at 2028, most likely 2045, pessimist see it at the end of the century. We all have already a double self-consciousness, one residing in the left half of our brain and one in the right half but mostly they collaborate flawlessly (the two consciousnesses are proven when the connection between both brain-halves is cut as for severe epileptic patients and probably “partial consciousness” exist in different parts of our cortex according other clinical experiments). Sharing the cloud as many apps do today alters the experience of self-consciousness as early observations by teens and millennials seem to confirm. Thanks for the historical view and the possible futures — depending on what we humans do — emanating from the elements you enumerated. As humans we really have a lot to build from if only we have a larger sense of community: as species living in this unique, mostly blessed and beautiful planet Earth. And the most important one, changed by chance. My mother as a girl dropping her handkerchief by accident and father as a boy picking it up… A billion of other woman, a billion of other man, zillions of other combinations were possible. I just got back from LAX awhile ago. I was seeing a buddy off at Int’l terminal, so I parked all the way towards Terminal 1 parking… knowing there’d be a protest today. I’d figured the protest would be confined only within the Int’l terminal area, as it was Saturday nite. 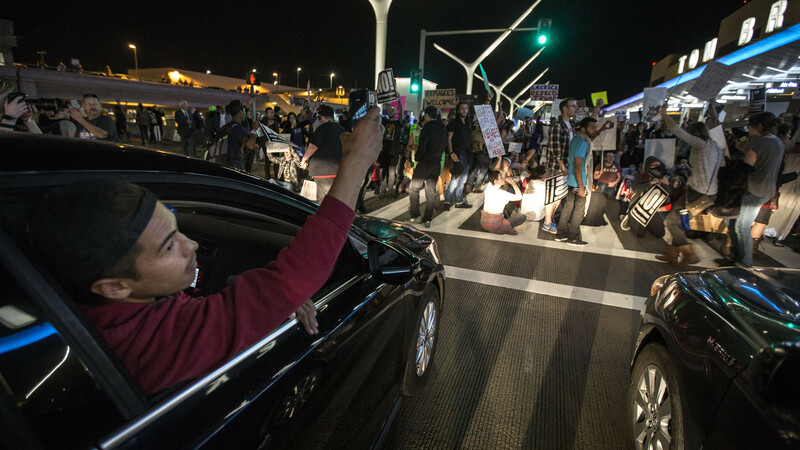 As luck would have it, todays protest was a lot bigger and LAX was closed down for a couple of hours. Unable to leave the parking lot, I decided to join the protest. Actually met some really cool folks, yuppies, lawyers for the ACLU and some Iranian lawyer group and some Muslims. Got a couple of numbers too. What I noticed was most there didn’t know what they were protesting. #MuslimBan , there was also #NoBanNoWall , so I poked around and asked which countries were affected? and how long the ban was? A lot of dunnos, and Trump hates immigrants and Muslims sentiments. Actually, the executive order re #MuslimBan only covers 7 countries, 6 of which are war torn (Yemen, Somalia, Sudan , Libya , Syria & Iraq) and then Iran. I’m a big supporter of Iranian students coming here, most of them tend to be secular to moderate; though immigrants i can see needs more vetting, since Iran does have a very elaborate sabotage type strategy (taken from the USSRs playbook). those who’ve already gotten their visas from US embassies abroad should be dealt with on a case by case basis, with a lot of leeway towards accomodating their visit (US Embassies did grant them visas afterall). And I thought genius! Can you imagine the City Attorney’s office vs. Session’s Justice Dept. going at it in the Supreme Court? If visas were awarded by Dept of State, and detentions go longer than 24 hours, then it’s an illegal detention. This was a really good point to make, josephivo… though I’m not much of a protesting type, today (though reluctantly and with a lot of reservations, and for the most part by accident) I “protested” , it didn’t really matter too much that I only agreed with the Habeas Corpus point of the protest. But it was the feeling of camaraderie and putting one’s body in harm’s way (relatively speaking, it was a mellow protest for the most part). I bid my new found friends farewell and good luck, as soon as I noticed the bad elements move in close to dusk, most too left around this time. As we speak, there’s still some police activity going on at LAX via the Twitter feed, stragglers mostly. But all in all a good exercise in participation. So yeah go out there and protest, but know the facts, not just the chants; most importantly know when the crowd shifts to a family friendly atmosphere, to one with black masks intent on inciting. A French commentator explained how the executive order will have the opposite effect. Attacks came from Belgians in Belgium, Frenchmen in France, Americans (and – now exempted – green card holders) in America. Sensitive Muslim youth in those countries will get a little extra push in their belief that Belgium, France, America…, the “Christian nations/crusaders are the enemy”. Also the limited resources for “extreme vetting” will be used on less important subjects. I totally understand coming from the inside threats, but focus on inside threats, should not eliminate outside threats concerns. All threats must be managed, but lately in the EU (the trend) , you have either terrorists from the countries in the ban (immigrants) or kids who grew up in the EU go to these countries then come back (citizens). but very specifically, where countries are now in war… which means most of these folks are getting their visas from other countries (no US Embassies open), which means a lot of Asylum (humanitarian, refugee status) types visas, hence the temporary moratorium , to study the process , but keep in mind that the Muslim countries where terrorists usually come from are still very much open travel. Though I understand the optics will play more to the America is racist sentiment, and I did get to talk to Muslims at the protest (who came as families) who felt as such, interestingly I saw quite a number of Sikhs holding signs that said, I’m a victim of beating (or racism) because they think I’m Muslim (standing up with Muslims)… very touching indeed, especially if you know the two group’s history. So Sikhs were there a plenty standing up for Muslims. But the point I’m trying to make is that the media is not ‘splaining it very well, 7 countries (Iran not war torn); BUT all other Muslim countries still open. And it’s Temporary. It should be the Asylum Ban visa order, LOL! There are thoughtful laws and there is red meat for supporters. And for me both are OK. Only if the red meat has the opposite effect of what is was intended for than I have questions. “Reduce the threat by preventing people sneaking in”, but the threat will increase by inciting potential domestic terrorists and by misusing scarce resources. There are plenty other means available to overhaul current failing (?) procedures. The world is dark and full of terrorists. But I have promises to keep, and so forget analyzing the logic and consequences of my EO. then you revise the process. But a full stop needed to happen (that’s the acting decisively part), whether it’s good policy or not, stupid or genius, we’ll have to wait… the idealist approach vs. realist approach. As for hundreds of thousands of visitors and 500,000 immigrants, I think these are simply the folks affected still outside the US, not necessarily the ones stuck at airports right now. in the border with Mexico though are a string of holding facilities, with men, women , children and the elderly , all waiting to get deported to Mexico and/or Central America, are housed…. no Habeas Corpus since, they are essentially waiting for their rides back to their home country. But the count of those actually detained at Int’l airports both in the East and West coast ports of entry number closer towards the low hundreds. 😉 Essentially they got caught up in the transition , change of policies; and now getting process through, most are actually permitted in (grandfathered in essentially). Around 375 is the closest to anything official I found Googling, edgar, which makes sense, aside from DHS, family/friends would also report possible detentions, so less than 500, with most now processed through is what I’m leaning towards. Therefore, the following statement is incorrect, is that not so? “It should be the Asylum Ban visa order, LOL! How so? isn’t Asylum/refugee status a type of immigration status? Don’t you apply with the US Embassy ? To enter the US don’t you have to “qualify”, isn’t this “qualifying” at heart of this issue, and yada yada yada… ? Or is your contention that it’s not only Asylum at issue (to which I would agree, and yada yada yada… ), ALL travel originating from these 7 countries are suspect under the order. A simple Yes or No answer, please. That number , edgar, is a hypothetical (an estimate if you will), it’s not like the DHS count of folks detained at airports. As for 500,000 legal immigrants, how many of these are which types of immigrant status, and which countries are they accounting for? My contention is that your statement which I quoted is incorrect. How so, when there’s no telling how many Asylum seekers and refugees are accounted for? we only have the fact that 6 out of the 7 countries are war torn… so probability wise Asylum/refugee immigration will be high, no? “Asylum ban stands”. Does this means that the US retreats from the Geneva Convention (1951 Refugee Convention)? Josephivo, apparently so. It is a failure to meet humanitarian obligations and protect refugees under the convention. The further irony is the ban encompasses foreign nationals who have helped American forces. That the ban is temporary is no excuse. “Asylum ban” was meant to address #MuslimBan, ie. it’s only 7 Muslim countries, hence not a “Muslim ban”, though an “Asylum ban” seem more appropriate was my point, I didn’t mean it was something quantifiable… just that it’s not a “Muslim ban”. As for, “Does this means that the US retreats from the Geneva Convention (1951 Refugee Convention)?” ; everything’s up in the air with Trump now, josephivo, but my bet is the WWII mindset is done, everything’s up for re-negotiation, all post -WWII policies are up for discussion now (which I’m totally for). and an influx of refugees from these war torn Muslim nations means the probability of EU-type ghettoizing than not, I’m sure refugees from other countries are still welcome, I believe some deal with Australia re refugees will still be honored. Just these war torn countries, where Muslim salafi terrorist groups dominate (not Iran, again that’s a different issue all together more closely related to USSR and Cuba during the cold war). So there’s two ideas converging here, that refugee influx tend to be de-stabilizing (Norway, Denmark, etc.) , hence no bueno for us, and the second is the vetting issue basically we need to ensure our vetting is tight. I suspect they’re very few though. but since these applications require those military personnel who know them to essentially vouch for them, their applications tend to be fast tracked by State Dept. officials, so I’m sure they’ll waiver them through, but they don’t make up a big number simply because most are already here. Since our absence in Iraq the number of foreign nationals who helped us have dwindled, either they’ve come here already or just opted to stay period. The folks that are helping Special Ops there now, they may be affected by Trump’s order, but again, the Americans they ‘re working for will vouch for them. Which only leaves us Afghanistan, and Afghanistan and Pakistan aren’t part of the ban. So my point is that the foreign nationals who helped American forces have always been afforded priority, so long as there’s American personnel to vouch for 😉 (which above & beyond, qualifies for vetting). But the bulk of those wanting to come here aren’t as vetted, hence the worry. What is the unique characteristic of the people banned from traveling? It is not that ALL are asylum seekers. It is that ALL originate from Muslim-majority countries. Therefore, to call Trump’s executive order an Asylum ban is incorrect. It also glosses over the fact of religious discrimination. Whether the ban applies to the total Muslim population or to a part of it is irrelevant in terms of the common and distinctive characteristic that underpins the ban. The discussion is not about immigration, but about a counterproductive, stupid, vague and non-vetted executive order with the only purpose of throwing red meat at supporters. The policy discussion on immigration or on proper risk reduction of terrorism are interesting too, but require a specific blog. Both are relevant for the Philippines because of the millions trying to leave this country and because of endemic terrorism. If I were asked is this ban on immigrants right or wrong I would’nt know what to say. I know it’s easy to condemn Trump because we all have our heart in the right place. But consider this — why are western countries always subject to this barrage of criticism whenever they take an anti-immigration stand in the face of a deluge of immigrants from Islamic countries. Why does’nt people condemn 16 other countries who have a racial policy on not just immigrants, but visiting. These countries ban all Isreali passport holders — Syria, Iran, Iraq, Sudan, Yeman, Libya, Malaysia, Brunei, Algeria, Bangladesh, Kuwait, Saudi Arabia, Oman, Pakistan, UAE and Lebanon. My point is, these state policies are a separate issue. Chemrock, No doubt each country can control its borders. We have been rudely awakened. As RHiro has stated, the American Century has ended. It was a glorious ideological empire — liberty, democracy, equality, human rights — and now all of that is gone. The trading empire of China is about to begin, and it’s all about materialism. edgar , you’re correct Islamic terrorism is the focus and the reason for the ban , but how is this discrimination? As chemp points out , most (if not all) Muslim countries discriminate against Israelis, period. Sauid Arabia/UAE and Kuwait have consciously limited their intake of these very refugees , I’m sure realizing the potential for de-stabilization (are they discriminating based on religion? 😉 ) OR are they simply acting on national interest? are free to come and go still (only 7 countries are involved). What exactly is “stupid” ? you’ve not explained, you pointed out numbers and challenged “Asylum” but haven’t argued the stupidity contention yet—- like I said above, to josephivo… was it wrong to penalize those already in planes and at airports abroad, yes! but only a handful were affected in that, and most are already released. I’d stress that , at heart, America never wanted to be the world’s saviour, Joe… de facto , this fell on us. America at best is a reluctant saviour , Trump is re-evaluating post WWII policies, but the reluctant world’s policeman has been around since the turn of the century , Ron Paul was the most recent, but Mark Twain too represented isolationist ideals, so Trump is just one in a long line of Americans… so he’s not so much an aberration when viewed thru history. Agree that America has been the reluctant savior. The alternative was chaos and rule by totalitarians, a fate the Trump Administration seems to concede to the ‘outer world’. One of the best athletes in our country and a role model for society, especially for other Muslim teens, was refused to travel. A European champion in his weight class on his way to the US open taekwondo competition. College student, good grades, but his estranged elder brother was a terrorist. Still, the risk for the US was zero. China will not take over with Chinese dominance, nor Russia for that matter, they’ll be playing it close from here on out, like the US, start building walls, limiting immigration, etc. Something wicked this way comes… it’s called Climate Change. That’s my big picture, temporal, geographical view , the lens from which I’m evaluating Trump’s moves. I’m assuming that TKD athlete was able to eventually get a waiver and come into the US? the no-fly list isn’t set in stone, folks have been wrongly placed on it, ie. guilty by association; mistaken identity, etc. there’s an appeal process in place. And if enough Americans (and recognized Europeans) vouch for this kid, they’ll allow him entry. Depends who you define as “they”. I’m talking about the teenagers in his TKD club in Brussels. They were looking up at their hero, working out like hell to be one day at his level able to compete with whomever in the word. But what if you cannot compete because of the wrong passport? They are rationalizing their disappointment. They are easier targets now if one of these garage-mosque imams comes along to invite them. An ocean is made up of many drops of water. Too many negatives are going around, we should be much more careful with the precious positive examples. World champions deserving more esteem than martyrs. For this travel ban all are equal and that is the lazy approach I’m talking about. World politics is the next thing. but the more this whole thing gets fine tuned, I’m sure he’ll eventually get a visa… if there’s anything consistent with American visa/immigration it’s the weight that it gives to athletes and artists (and academics), but yeah the current vetting process will have to be navigated through. the Boston bombers were also wrestling/MMA competitors. to do things out of fear that they’ll retaliate is bad policy in my book, this we can differ… again realist vs. idealist views. Re: Belgian Tae Kwon Do champ. I just googled this, and the one denied entry was an iranan Icelandic Taekwondo champion. But I can’t find news about the Belgian bomber’s brother Taekwondo champ who’s been denied entry to US recently. I’m at a Googling dead end as well, karl… although there is such a Belgian brother of a terrorist, but the article was for the recent Olympic games, featuring his story, nothing at least on English Google, maybe josephivo’s news is only in Belgian? Joseph gave a link below,but it is in Dutch. The exchanges in this tread is rich for me. Thanks guys. Me too, we are non monetary billionaires. Even if it seems that the cat bit my tongue lately, I will continue to participate in the TSOH discussions. 1. Fascinating — a window into the future. 2. In the long view, the history of mankind has been one of unification, from clan to tribe, to nations, to the united nations, and to regional alliances. 3. The centripetal forces, tending towards the center, have been religion, colonization, trade, and technology. 3.1. Perhaps the most forceful centripetal force will be the realization that mankind has to escape a dying star. 4. The centrifugal forces, tending away from the center, have been religion, tribalism and nationalism, war, and protectionism. 5. What I would like to see is peaceful unification with respect for diversity, the view that we humankind are culturally and individually different but essentially the same. 6. I think the greatest frontier has always been the rise in, and the broadening of, consciousness. The successive waves of historical change attest to this. Our sense of self and community in the 21st century is far different from any homo sapiens living in previous centuries. 6.1. As Arthur Clarke says, to them our technology would be indistinguishable from magic. This little device we carry in our pockets allows us to view moving pictures, to communicate with someone anywhere in the world, to remotely start the air-conditioner at home, and to get goodies by simply tapping it against another device. 6.2. Going back to item 3.1, is it possible that we are caterpillars that will emerge from our cocoon that is the the earth and metamorphose into the cockroaches of the universe? In Physics the centripetal force on an object (such as the stone in David’s sling) is exactly balanced by the centrifual force (on the stone held in place by the leather strap) tending to make the object fly out. In the near-term, I wonder what centripetal force(s) will preserve the fragile status quo among the three countries — US, China and Russia. Evidence of UFO from the now released, previous secret, files of the CIA? Is this a case of yada yada yada? Or more from one than the other. One thing is agreed — from my readings and commentaries in TSH — China at this time is at a great disadvantage militarily. So if that is the premise who is doing more of the yada yada yada? Juana’s and Edfgar’s discussion of the genome based movies like the Brave New World and Logan’s run might be a good represntation of what our future could be. Bionics- Who could forget the six million Dollar man. As for AI and driverlesscars that would be the Knight Rider. There is this new advocacy ad calling for the abolition of coal power plants. Gina Lopez was laughed at when she moved for the auditing of coal power plants. But the DOE has other plans. They say most of the stars we see at nigh no longer exist. I think the Sun will turn red giant then turn to a whilte dwarf for a million more years, that is if those who calculated them is spot on. In the meantime we have Mars and moon to move to. Karl, If I may: watch in NETFLIX “iBoy” and see how far it goes when COULD BE hacking is peanuts, artificial intelligence is plastic, holograms mere bubbles, materialization and levitation only metaphysics and telekinesis is merely magic. For good and not for evil, those things can make life DIVINE. More real than Marvel Comics imaginations. the Philippines has geo-thermal plants (Mammoth, CA is run by geo-thermal, covering Indio/Mono counties of California) , but I think there isn’t other options, no? Natural gas plants , maybe? Yes Lance maybe soon enough we will go towards that direction. About nimby it is easier to criticize those who say Hey,not in my back yard,but when it happens to you, you will have a rude awakening. I think cell phone towers if they are high or far away enough, shouldn’t affect you, but i know the study’s and the jury’s still out. So if you can fight it, tell ’em to put it somewhere else, if not maybe negotiate to have a taller tower? hell, maybe you can negotiate for faster internet 😉 . Too close for comfort, it is just accross the street. As for the height, it is ten storeys high 33 meters, I will just pray it wont fall when a strong typhoon hits it. Thanks for your inputs Lance. Popoy, I will watch iBoy.Thanks. one failure Instead of success. Said the New Miss Universe. Inclusion my friend, the word is inclusion. We should stop marginalizing and alienating a whole bunch of people and then allowing them the ability to vote. Policies (and votes) have consequences. The Rodrigo Duterte backlash is the result of failures by chief executives before him (post-Marcos dictatorship at least) to institute inclusive economic reform. The Donald Trump backlash is the result of failures, decades in the making, of both the neo-con and neo-liberal polarizing policies. No deep mystery for why these two clowns are now romping off becoming harbingers of death, decay, and division. The marginalized are fighting back, the wrong way, it now seems. And why people feel excluded? Or why were they forgotten by regular politicians? People in the bubble tend to look at the veneer, the shinning outside layers of civilization, the top of Maslow’s pyramid as self-actualization. But for many unfashionable basic needs are still unfulfilled, poverty and security. Good news: PRD suspended his war on drugs temporarily. No more tokhang and buy-bust operations for now until such time when PNP ranks had been thoroughly cleansed of bad cops. Bad news: His war on drugs March 2016 extension deadline is moved to the end of his term in 2022. Are we going to wait this out? Pray? Or help speed up change by telling the administration that the war on drugs is an epic fail and should be shelved; and the PNP rank cleansing will take a long time and a presidential term is not long enough to root out all the scalawags? Why don’t the government focus on poverty and hunger alleviation programs? On creating jobs? On finding ways on how to enlarge the middle class population? On giving people sustainable livelihood and self sufficiency skills instead of hand-outs? Who vets the executive order? Is it a misnomer then? – From the citizens, for the (all) citizens. The citizens, civil organizations, the press, the academe can be consulted. Was our President Duterte ahead of President Trump on this sign of the times — raised fist? While we are on the subject of “stream of history” and of my previous post on US President Trump, he just nominated “a Scalia” to the SC. Expectedly, the Democrats are unhappy; they would rather have what they call a “mainstream” nominee — or a liberal. Of course confirmation will still be needed on a 52-48 (R-D) senate. But Neil Gorsuch, the nominee, most probably will be confirmed. With Gorsuch confirmed, the US SC will be back to 4 liberal Justices, 4 conservative Justices, with Kennedy the Chief breaking deadlock on important issues. My take — the balance, I believe, is healthy. @LCpl, the reply on the proper place seems not to work… So let’s try here. You ever heard of double nationalities? These sports clubs were one of the initiatives to get kids engaged. This kid follows a double path, an academic and a sports one, excelling in both. For those who watch UFC. UFC star Gegard Moussassi might not make it to his upcoming match because he was born in Iran.But if his manager is correct, he might make it.